A user views any type of content and selects the ‘share’ button. 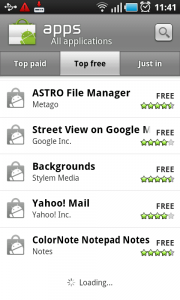 A dialog shows a list of apps that are available for sharing the content. 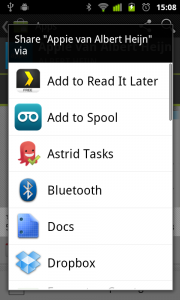 If there are more apps than can be displayed in the dialog, the list will become scrollable . The user wants to share an object or send it to some application/location. The typical use is with picture applications where users can use the share button to post it on Facebook or upload it to an online picture gallery. 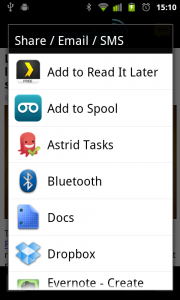 On Android the sharing mechanism is extendable and any application can add itself to the list. As such the possibilities are numerous. If you want to exercise more control over the sharing functionality, try using a custom sharing option. The list of sharing services is not very intelligent. The apps appear in alphabetic order and not in order of most relevance/usage. 1 Dutch News provider NU.nl shows a share button at the right of the action bar on every article page. 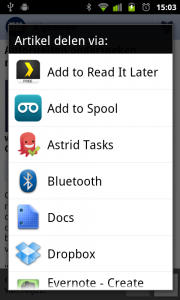 3 ... a second dialog appears containing a list of all the apps by which the article can be shared. 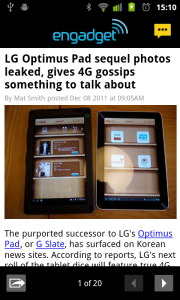 1 Engadget displays a different kind of share button in the bottom left corner of the screen. The icon that is displayed in the button is known as a share button coming from iOS devices. 2 When the user has tapped on the button a dialog opens, containing all apps to share the content by. 1 Android Market shows in its action bar at the top of the screen a share button with an icon that is also commonly known in apps. 3 ... a dialog is opened containing the apps to share by. It’s also a very undervalued way to workaround the lack of a particular permission WITH the user consent. (example: an application with no Internet / SD card permission could let the user share the database/exported data using the share permission. The user will thus be able to export his data to the SD card (sharing with a filemanager), to his mailbox (sharing with GMail), to his DropBox and to pretty much every file-enabled application. 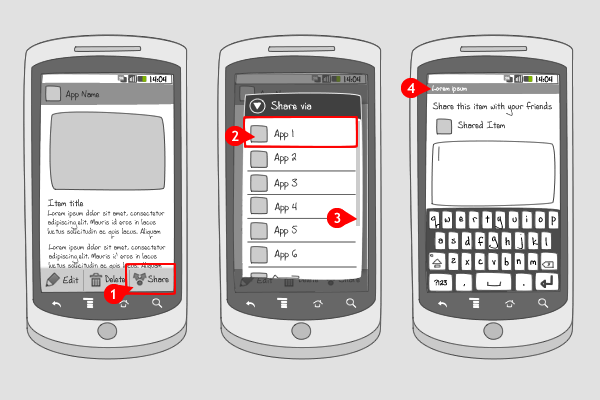 I am trying to create some Android mockups and was wondering what type of a control the sharing button is. It looks like a options menu, but I cannot find it in my library. I am using Justinmind prototyper. Engadget – Using the iOS share icon is quite simply a bad idea!